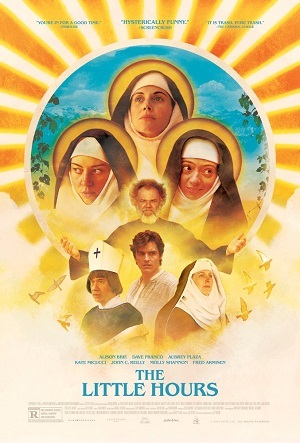 After working together on the horror-comedy Life After Beth and the relationship comedy Joshy, writer/director Jeff Baena his real life leading lady Aubrey Plaza join forces once again, and without a doubt The Little Hours is the pair’s most audacious, crazily ambitious effort yet. An adaptation of Giovanni Boccaccio’s 14th century masterwork The Decameron, the film is a wild and wooly piece of sexually-charged pulp fiction revolving around a handful of nuns involved in everything from shagging the latest stable boy to full-own witchcraft. It’s a controversial, intelligently imaginative laugh-out-loud winner, and while Baena will likely never be thought of as the second coming of Italian maestro Pier Paolo Pasolini, that doesn’t make what he’s accomplished any less impressive. Sara Michelle Fetters: Where does one get the idea to just jump right in and make a nun comedy out of Boccaccio’s The Decameron? Jeff Baena: Well, when I was in college I got a major in Film but I got a minor in Medieval Renaissance Studies. In one of my Renaissance classes we studied The Decameron. It really made an impact on me. I thought it was really great. So I just had it in the back of my mind as something I kinda wanted to tell the story of. Then about a year-and-a-half ago I had a friend who was staying at my house. 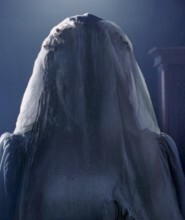 It somehow came up in conversation that I always wanted to make this like medieval combat nun movie, and he was like, “You gotta make that movie!” So I talked to my producer [Elizabeth Destro], who produced my first two movies, and she thought it was really funny. Two or three months later I was in Italy scouting locations and it just all started happening. 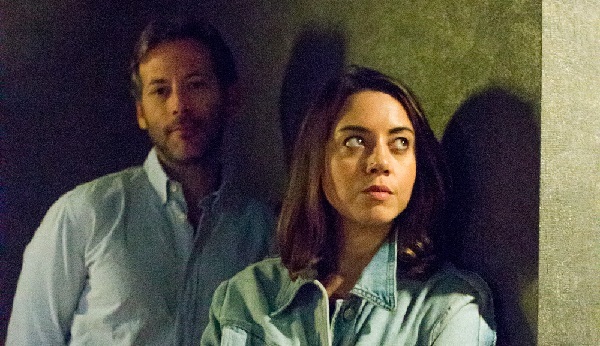 Aubrey Plaza: I was like, “Sign me up!” Yeah. I mean I thought it was totally insane. I love things that are insane. Sara Michelle Fetters: What’s the challenge when you look at something like this and you want to make it contemporary but you still want to respect and pay homage to the source material? Jeff Baena: Well I tried my best to kind of achieve the spirit of the original story. The Decameron is amazingly funny, even though it’s almost 700 years old. I wanted to honor its sense of humor and its silliness. But also do something that I think paid strict attention to historical accuracy. I wanted to play into sort of the political and societal dynamics that were going on at the time and play off of them a little bit. And, yeah, it was less about sort of finding similar movies or anything like that. It was more about just honing in on what makes that story and Boccaccio’s storytelling special and how I could best achieve something in the spirit of that. Sara Michelle Fetters: Did you find that that was an easy thing for you to tap into, Aubrey? Aubrey Plaza: I mean, I would say that being in those costumes and being surrounded, you know, in that setting was such a huge. You know, diving into that mindset. As far as how we were interacting and stuff, I mean we really just had to trust Jeff, kind of follow the story and just not play it like we’re in an old-timey period film. Just try to behave like human beings and focus on our personal journey in the movie. That’s what I did. Sara Michelle Fetters: But how hard is it to hold your composure when you’re sitting there in that group with Alison Brie, Kate Micucci and Molly Shannon? You’re all so talented, so funny, and yet also so very different. Is it difficult to just keep from cracking up at something somebody else in the cast is doing? Aubrey Plaza: For sure! I think as the shoot went on, we became so used to seeing each other like that, so it got easier. But in the beginning, especially when we were shooting in the chapel, which was the first couple days, we were all freaking out. We were laughing so hard. It was so much fun and yet really hard to keep it together. Sara Michelle Fetters: For you, Jeff, what’s it mean when you are able to pull together a cast like this? To venture with you all the way to Tuscany to make a low budget comedy out of The Decameron? Jeff Baena: It is an honor and it feels great. I mean, all these people that did this movie are some of my favorite people in the world! I think they’re the funniest people and some of the most talented actors around. The fact that they sort of opened themselves up to the experience and allowed themselves to commit to something that on paper sounds sort of insane; it’s a testament to their desire to try something different and to challenge themselves. To just be open to new experiences. I think when you tell people, “I’ve got this nun comedy that takes place in the Middle Ages and we’re gonna go to Tuscany for a month and shoot, what do you think?” that’s definitely a litmus test for what your priorities are. I think all of these people are just super committed to trying to create, to be present and to be honest. They’re all amazing performers. Sara Michelle Fetters: What have you both learned about one another, transitioning from one film to the next? Aubrey Plaza: I mean, I don’t like, you know, talking super personal about our relationship, honestly. But I’d say it’s an amazing experience to work with your partner in this way. I’ve worked with Jeff since his first movie. I’ve seen him evolve and I’ve seen him grow. It’s a really special dynamic that we have. It’s challenging at times but it’s also really rewarding to do something together like this. I don’t know what else to say. Sara Michelle Fetters: Jeff, I think what I loved so much about your work is that I can tell each film comes from a singular voice yet I also love that they’re all so different. It feels to me that you’re interested in exploring new and different ideas and topics every timeout, that you don’t feel like you have to be stuck in any one genre, even though each film contains more than their fair share of laughs. Is that something that you’re shooting for? To keep branching out like this in this manner? Jeff Baena: I think when you make a movie it’s such a massive undertaking that if you’re not interested in what you’re about to do, it’s gonna be hellish. I think I just decide to focus all my energy on something that is exciting to me, something unique. I don’t want to be doing anything that’s a retread, something that’s been done before. I want to try something different. I have a lot of interests that bounce around my head. I’ve been lucky enough to be able to explore things without having to have like a 14-year break between films, so that means my ideas haven’t had the time to grow stale. It’s just the benefit, I guess, of the way technology is today, that you can put a movie together and shoot it within a year. So, yeah, I never want to be walking down the same concrete I’ve walked down before. Because, what’s the point of doing it if it’s been done before? 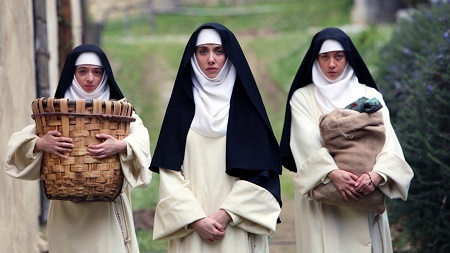 Sara Michelle Fetters: At the end of the day when people really get a chance to start seeing The Little Hours, what do you hope they take away from it? What do you hope they’re talking about afterwards? Jeff Baena: I mean for me the sort of primary reason that I chose to make this was to highlight just how similar we are to people in the past and how, even though history separates us, that we’re still just people. It’s human. And even though this book is from 1350, the humor in it transcends time and is still relatable and very, very funny; that these are all just stories of people living their lives, regardless of the context. Sara Michelle Fetters: And you, Aubrey? Aubrey Plaza: I hope they laugh. I hope that people find it funny, but I also think there’s a real sweetness to it all and I hope that people respond to that. I just love that Jeff made a movie like this right now. I think it’s rare that people are making stuff like this, taking such risks when making movies. After watching this and seeing that, I hope that more people will be inspired to go crazy and make weird stuff. That would be great.